Pat on the Back to Medina, OH team. 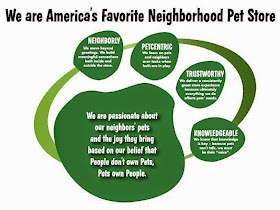 This neighbor’s feedback captures the essence of all four paw print behaviors- NEIGHBORLY, PETCENTRIC, KNOWLEDGEABLE and TRUSTWORTY! The Medina, Ohio Pet Supplies Plus location is the best ever! I am a weekly shopper. We have rescued cats and kittens for 16 years. When I come into the store, everyone greets me by my name. They are always helpful. Someone always helps me with the order to the car. They share in our joy and grief if we lose a kitty. It is great to share stories of our pets. The store is always clean and neat. I love shopping there, everything is easy to find. The staff is amazing I would never consider going anywhere else for my cat’s needs!